Early in the Bush administration, a U.S. spy satellite was assigned to shoot high-resolution pictures from space of one camp in mountainous northeastern North Korea. At first, officials were mystified: Where were the camp’s fences? They repeatedly ordered the satellite to expand the frame of its pictures. Finally, a senior administration official tells U.S. News, the perimeter was located, revealing a camp larger in size than the District of Columbia, with clusters of buildings that look like villages. “If you look at a map of North Korea, it would not be just a dot on the map. It’s a perceptible portion of the map,” says the official. “There’s a general lack of understanding of how depraved the human-rights situation in North Korea is,” the official says, predicting that “the horrors that will come out” will rival those of Cambodia in the 1970s. And yet, stories from the North Korean gulag receive surprisingly little attention in South Korea and elsewhere. The South Korean government has turned the spotlight away from the North Korean gulag. The South’s “sunshine policy” of reaching out to the North seeks to avoid confrontation with Kim Jong Il in favor of encouraging Pyongyang to open up to the world. But those who endured the camps are anything but indifferent. They describe a level of savagery that satellite photographs can never convey. Nor does the Orwellian terminology for the camps reveal much. Political prisons are called “management centers.” Those centers, in turn, are divided into two categories: “complete control zones,” with life imprisonment, and “revolutionizing process zones,” from where some inmates, principally family members, might eventually return to society. The prisoners are banally referred to as “resettlers.” Other camps, dubbed “re-education” places, lump together common criminals and political prisoners. The camps also generate funds for a cash-strapped regime whose economy has shrunk by about half since 1990. Prisoners mine coal, harvest trees, and manufacture goods for export and domestic consumption–from snake brandy to bicycles. They gather the roots of plants used for traditional medicines, some destined for sale in Japan. The hot pepper sauce from Ahn’s camp at Hoeryong sits on the tables at Pyongyang’s Koryo Hotel, where westerners stay. Ahn likens the camps to Nazi-run Auschwitz. The survivors agree. As he sits in a smoky Seoul coffee shop and recounts his past, Lee, 40, can hardly believe his good fortune. Lee once worked at the heart of power in Pyongyang, a trusted agent for Kim Jong Il in the years before Kim succeeded his father, Kim Il Sung. The names “Kim Jong Il” and “Kim Il Sung” were carved on Lee’s pistol; he considered it “the greatest honor” to serve in Pyongyang’s security elite. Lee was isolated from his family, but he enjoyed the rare perks of good food and clothing. It was not to last. When officials discovered that one of Lee’s cousins was a driver for Kim Jong Il, he was dismissed for security reasons because of possible collusion. He returned to his hometown and became an executive in the local branch of the Communist Party. But he was shocked to see people eating grass because of crippling food shortages. He began listening to South Korean radio–a grave offense–and in 1994 decided to defect. Lee made his way into China but was tricked by North Korean agents, who smuggled him back over the border. He says that only an order from Kim Jong Il spared him from death. He was sent to the No. 15 prison camp at Yodok. A banner greeted unlucky arrivals: “You shouldn’t negotiate with class enemies.” Lee, like the other unfortunates, received a ration of 4.5 ounces of corn powder, a few cabbage leaves, and salt. His fellow prisoners included ex-military officers, professors, and others who fell under suspicion after living abroad. They toiled in coal mines, forests, and farm fields. Beatings were routine: Lee rolls up his pants to show the grayish-brown scars on his right leg, reminders of blows from long wooden sticks. He lost most of the sight in his right eye, his teeth were broken, and blood still oozes out of his left ear at times. Of the 1,000 people in his prison unit, he says, about 200 died every year. “It was beyond my imagination. The officers treated prisoners not even like animals but like bugs. They stepped on them,” he says. But Lee was luckier than most. He was released without explanation in 1999–his weight having fallen from 207 to 119 pounds–and returned to his home village. But he became frightened when rumors circulated that he was a South Korean agent, and he decided to flee through China again–this time successfully. Lee now runs an organic food store. Kang says he nearly died of malnutrition. Survival depended on finding food beyond the meager diet of corn and salt, so he and others laid traps for snakes, rats, and bugs–eaten cooked or raw, if need be. Hunger dictated. “I wanted to eat anything,” he recounts matter of factly. Ultimately, though, Kang was also one of the lucky ones. He says he wasn’t beaten severely, and part of his sentence was served on relatively light duty at a recycling center for shoes and clothing. At age 19, he was released on Kim Jong Il’s birthday. Five years later, in 1992, he escaped the country, helped by ethnic Koreans living in the borderlands of northeastern China. Now, Kang is a reporter for the Seoul newspaper Chosun Ilbo. His life experience is now his professional beat: North Korean affairs. Another graduate of the prisons, Lee Soon Ok, had a rougher time of it. She had handled accounting and managerial work at a party distribution center. But when she rebuffed a security chief who demanded an extra jacket, Lee’s fate was sealed. She was accused of embezzlement and disobeying party policy. The result: seven years at the No. 1 prison camp at Gaechun. “My family was split apart in one day,” she says grimly. At the camp, Lee was tapped to supervise production of exported goods: artificial silk flowers bound for France, handmade wool sweaters for Japan, decorative needlework for Poland. Suits and dress shirts were sold through Hong Kong, getting their origin labels there, before shipment to Europe. If quotas were missed, Lee says, she faced torture. Guards stepped on her head, knocking out teeth and skewing the left side of her face. During one beating, her left eye started to pop out of its socket. She pushed it back in with her fingers. Her arms were injured after she was hung in chains from a ceiling. Even now, she has difficulty sitting or standing for long periods. In interrogations aimed at forcing a confession, Lee, now 56, was also subjected to water torture. She says guards force-fed her water by pushing the spout of a canister into her mouth. They laid a wooden plank across her abdomen–and pressed down, forcing water out through her mouth, nose, and bladder. “It feels like your intestines are exploding. There’s no way even to describe the pain you feel,” she recalls, with no trace of emotion. “It was a system to kill us.” Lee Young Kook, jailed after trying to flee North Korea. Yonhap News agency claims that the number of North Korean defectors to Thailand has jumped more than 50 times since 2004. Radio Free Asia (RFA), citing a Thai newspaper, the Bangkok Post, said the number of North Koreans who illegally entered Thailand and were arrested soared from 46 in 2004 to 2,482 in 2010. Thailand is a frequent destination for North Koreans escaping through China. North Koreans are not granted refugee status in Thailand, but after serving their prison sentences for illegal entry, they’re deported to South Korea. Kang Chol Hwan is a former North Korean prisoner and author of The Aquariums of Pyongyang. “Stalin, ultimately the worst dictator probably of the 20th century, said that one death is a tragedy and that a million deaths is a statistic. A human tragedy of hellish dimensions continues in North Korea. For nearly a decade, an unknown number of North Koreans, possibly as many as 300,000, have defected to China. These brave men, women and children risk their lives to flee the mass starvation and brutal oppression brought upon them by Kim Jong Il’s Stalinist regime. Sadly, Beijing’s official policy has been, and remains, to arrest the refugees and forcibly return them to North Korea, where they face imprisonment, torture and in some cases execution. While western critics denounced President Bush’s decision to include North Korea in the Axis of Evil, the long-suffering people of North Korea cheered it. I know: refugees have told me. They know how Ronald Reagan’s description of the Soviet Union as an “Evil Empire” was an early and important step toward its collapse. Moreover, the Axis of Evil remark proved prescient after North Korea’s confession that it had a large, covert nuclear-weapons program. More and more high-ranking defectors have told us that Kim Jong II’s government is in a desperate situation, much closer to collapse than the outside world knows. This, they say, is why he needs the fear of nuclear annihilation to win concessions from the West, prop up his regime, and subjugate his own people. One must remember that the famine in North Korea is not a natural disaster, but a man-made one. The North Korean dictator uses food as a weapon against his own people, keeping them weak and dependent on the state. From 1994 to 1998 (the most recent reliable data the outside world has), at least two million North Koreans perished from starvation and related diseases. Nearly 50% of all North Korean children are malnourished to the point that it threatens their physical and mental health.I worked in North Korea for 18 months until I was deported in late 2000, for publicly denouncing the regime for its human-rights abuses and failure to distribute the massive amounts of food aid to the people who needed it most. After leaving, I knew the only way I could help the people of North Korea was to tell the world what I had witnessed and work to free the 23 million people who remain prisoners in their own country. During my interviews, I met with many human-rights activists who had devoted their lives to helping the North Korean refugees. Hiroshi Kato, a Japanese journalist and organizer of Life Funds for North Korean Refugees, based in Tokyo; San Hun Kim, a South Korean former UN official and human rights volunteer; Chun Ki Won, a South Korean Christian missionary; and many others. We realized from our experience in the field in China that the North Korean defectors had risked their lives fleeing starvation and oppression. My fellow North Korean activists and I have appealed to Beijing numerous times, asking them to change their policy toward the refugees; but to this day we have yet to receive a response. In late 2001, we agreed that helping North Korean defectors enter a foreign embassy in Beijing would be an effective way to bring the issue to international attention. Encouraged by other international and South Korean aid workers, who were consulted in the weeks that followed, we arranged a plan of action and made several trips to China to go over the logistics. Another strategy of ours was to create a flood of North Korean “boat people.” We made extensive plans for vessels to carry refugees across the Yellow sea from China to South Korea. Once again many activists and even a freelance photographer for the New York Times got arrested. Beijing treats the North Korean refugees—and increasingly those who help them as well—like criminals. China continues to prop up Kim Jong II’s evil regime even as thousands sneak over the border to escape it.Even worse, the South Korean government has largely turned a blind eye to the plight of their “brothers” to the north, and in many cases has actually hindered their escape. Our plans to cross the Yellow Sea were foiled in part by South Korean authorities who used surveillance, interception and minders to disrupt our plans. Read this again, for I wish to stress the shame of it: South Korean authorities worked actively to foil our attempts to bring North Korean refugees to freedom. But under South Korean law, North Korean refugees cannot be turned away. It is time for Seoul to live up to this promise. And it’s not just the officials. South Korean students spend their time and energy denouncing the presence of U.S. troops, instead of denouncing the evils of Kim Jong II. What many foreigners fail to understand is that the student movement in Seoul is heavily influenced by North Korean propaganda, and quite possibly given logistical and financial support through spies from the North. This is similar to the espionage and propaganda that was so pervasive in Europe during the cold War. 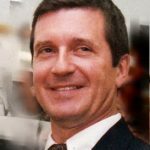 As a German who witnessed the fall of the Berlin Wall, I understand the destabilizing impact an exodus of refugees can have on totalitarian regimes. Despite arrests and beatings, my friends and I will continue our efforts to create a stead flow of refugees through Western embassies in China, by boat across the Yellow Sea, and at the North Korean-Russian border. As a German, I also know about Neville Chamberlain’s appeasement policy towards Nazi Germany, how badly it failed, and how disastrous were its consequences. The only way to truly help the North Korean people and to end Pyongyang’s nuclear blackmail is to hasten the collapse of Kim Jong II’s murderous regime. As President Bush said of Iraq in his State of the Union address, so too should it be said of North Korea: the real enemy of the North Korean people is not surrounding them but ruling them. North Korea requires immediate food assistance after heavy rains killed scores of people and submerged vast swaths of farmland, a U.N. office said Thursday. Floods caused by two storm systems last month killed at least 119 people and left tens of thousands homeless, according to the North’s state media. A city official told AP that it was the worst disaster in Anju’s history. The flooding, which occurred on the heels of a severe drought, renewed concerns about North Korea’s ability to feed its people. In June, the U.N. said two-thirds of the country’s 24 million people are coping with chronic food shortages. After the death of Kim Jong-il at the end of 2011, and the rise of his untested young son Kim Jong-un, North Korea appears to have shifted to collective rule from the strongman dictatorship it has been. Kim Jong-un is indeed at the head of the ruling coterie, a source with close ties to Pyongyang and Beijing has said, and added that the military has pledged allegiance to the unproven Kim Jong-un. This is a course what many analysts have anticipated — North Korea being governed by a group of people, though this is the first time for this approach since North Korea was founded in 1948. North Korea’s collective leadership appears to include Kim Jong-un, his uncle and the military, sources said. Kim Jong-un’s uncle, Jang Song-thaek, 65, is the brother-in-law of Kim Jong-il, and likely the power behind the throne, along with his wife Kim Kyong-hui, Kim Jong-il’s sister. Also anticipated by Korea watchers to be highly involved was Ri Yong-ho, the chief of the military. However, in July of this year, Ri Yong-ho was relieved of his military and political duties, after more than 53 years of service. So although only months into his reign, from this and other changes it appears that Kim Jong-un could be flexing his political power muscles. 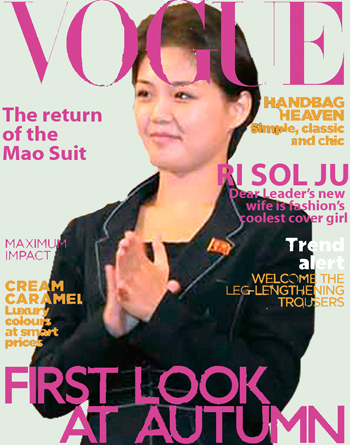 Ri Sol Ju is glamorous, young, and very chic — the freshest and most magnetic of first ladies. The first impression of Ri Sol Ju is movement — a determined swath cut through space with a flash of red soles. Dark-brown eyes, short black hair, long neck, an energetic grace. No watch, no jewelry apart from Chanel agates around her neck, not even a wedding ring, but fingernails lacquered a dark blue-green. She’s breezy, conspiratorial, and fun.